Introduction: Maxillary hypoplasia resulting in skeletal class III malocclusion is common among patients with cleft lip and palate. Large anteroposterior discrepancies and surgical scaring often leads to unpredictable stability of maxillary advancement with Le Fort I osteotomy and is known for a high degree of relapse. The aim of this retrospective study was to evaluate the postdisraction stability after 1-year of maxillary advancement done with rigid external distraction (RED) device in patients with unilateral cleft lip and palate. Materials and Methods: Records of 11 cases treated with RED device used for distraction of maxilla in cleft lip and palate cases were assessed. Lateral cephalograms selected were taken at the end of presurgical (T1), immediate postdistraction (T2) and 1-year postdistraction (T3). Five angular measurements and nine linear measurements were used to assess the position of maxilla in all three planes. P values were obtained for repeated measurement by analysis of variance with Bonferroni's correction for multiple comparisons. Normality was tested using Shapiro-Wilk's test. Results: The average 1-year postdistraction measurements (T3) did not differ significantly compared to the corresponding average postdistraction measurements (T2) (P > 0.05). Conclusion: Midface distraction with RED device provides a significant structural improvement for patients with cleft lip and palate. There was marked an improvement in dentofacial structures and results were stable during the retention phase. Midface advancement as described by Polley and Figueroa  advocates distraction osteogenesis (DO) principles to advance the hypoplastic maxilla especially in patients with cleft lip and palate. The aim of this retrospective study is to find out the postdistraction stability after 1-year in maxillary advancement done with rigid external distraction (RED) device in patients with unilateral cleft lip and palate (UCLP) treated over the period of 4 years in a tertiary care dental institute. This retrospective study consisted of records of patients with UCLP treated between March 2009 and March 2013 in a tertiary care dental institute with RED device for maxillary advancement. Previous history of orthognathic surgery or DO. Based on the inclusion/exclusion criteria's, 11 patients (8 males and 3 females) treated with RED device for distraction of maxilla in UCLP was selected. The age group was between 14 and 20 years with a mean of 16 ± 0.76. Lateral cephalograms of selected patients were used for this study to confirm the postdistraction stability of the DO with RED device. These cephalograms chosen were presurgical or predistraction (T1), immediate postdistraction (T2) and 1-year postdistraction (T3) [Figure 1]. All the patients had undergone the presurgical orthodontics, which consisted of leveling and alignment and decompensation of affected dentition using 0.022" Roth preadjusted edgewise appliance. Midface distraction was carried out using RED device after the presurgical orthodontics using a custom made casted maxillary splint covering the entire maxillary dentition with hooks in the canine region. This was to hold maxilla as 1 unit during the distraction phase. Same surgical protocol was followed for all patients. High-level LeFort I surgery was done, and RED device (RED II System, Gebrüder Martin GmbH and Co. KG, Tuttlingen, Germany) was applied to all patients. As per the protocol, after a latency period of 5 days, distraction was initiated at a rate of 1 mm/day and continued as per the treatment plan. Once the distraction was completed, the consolidation period was for 8 weeks. External frames are then removed, and facemask traction was used for next 6 weeks from the hooks of appliance in the maxillary dentition. Postsurgical orthodontic treatment was then carried out for settling the occlusion. In retention phase, bonded lingual retainers were used in both arches along with a removable retention plate in the maxillary arch. The amount of distraction done in each case is given in Graph 1. [Additional file 1] The cephalograms were traced using NemoCeph Dental Studio NX 2006, Version 6.0 (Nemotec ® , Madrid, Spain). X-Y coordinate system was used to differentiate between horizontal and vertical changes of midface and maxilla. The horizontal axis (X-axis) was a line through the nasion 6° upwards from Sella-Nasion line. The vertical line (Y-axis) was a line perpendicular to the horizontal axis through Nasion. Examined points were indicated as positive values when moved anterior and superior on X-Y coordinate and similarly negative value when moved posteriorly or inferiorly. Point A and ANS were used to record the position of the maxilla in horizontal and vertical plane to calculate the skeletal correction of the maxilla and also the relapse in the retention phase. Of 11 cases, 5 cases were selected randomly and retraced by the same operator after a gap of 1-week to check the intra-operator variability. The statistical analysis was performed using Statistical Package for Social Sciences (SPSS, Ver 11.5; Chicago, IL, USA) for Microsoft Windows. 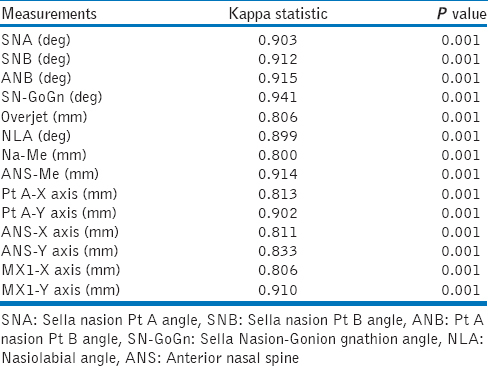 The analysis based on kappa statistics revealed that there was a statistically significant agreement between first and second evaluation (intra-operator agreement) for all linear as well as angular measurements performed in the study (P < 0.001) [Table 1]. Variables not normally distributed were transformed to normality using appropriate mathematical transformations. P values were obtained for repeated measurements by analysis of variance with Bonferroni's correction for multiple comparisons. P < 0.05 is considered to be statistically significant. Normality was tested using Shapiro-Wilk's test [Table 2]. The average postdistraction and 1-year postretention SNA, ANB, and nasolabial angle (NLA) were significantly higher compared with the corresponding average predistraction measurements (P < 0.001). The average postdistraction SNA, ANB, and NLA did not differ significantly compared with the corresponding average 1-year postdistraction measurements (P > 0.05). The average predistraction SN-GoGn values did not differ significantly compared to the postdistraction and 1-year postdistraction SN-GoGn (P > 0.05). The average postdistraction SN-GoGn values did not differ significantly compared to the average 1-year postdistraction SN-GoGn values (P > 0.05) (Graph 2a) [Additional file 2] . The average postdistraction and 1-year postdistraction overjet, PtA-X axis, ANS-X axis and Mx 1-X axis were significantly higher compared to the corresponding average predistraction measurements (P < 0.001). The average postdistraction overjet, PtA-X axis, ANS-X axis and Mx 1-X axis did not differ significantly compared to the corresponding average 1-year postdistraction measurements (P > 0.05). The average predistraction SNB, Na-Me, ANS-Me, PtA-Y axis, ANS-Y axis, and Mx 1-Y axis did not differ significantly compared to the corresponding postdistraction and 1-year postdistraction measurements (P > 0.05). The average postdistraction SNB, Na-Me, ANS-Me, PtA-Y axis, ANS-Y axis, and Mx 1-Y axis did not differ significantly compared to the corresponding average 1-year postdistraction measurements (P > 0.05) (Graph 2b). The angular and linear measurements to assess the position of maxilla 1-year postdistraction showed statistically insignificant changes. The results of this study are in agreement with the findings by Saltaji et al. and Sahoo et al. The results of the present study are similar to that of Datana et al. which highlights long-term cephalometric follow-up of the patients with UCLP and showed significant improvement in dentofacial structures with maxillary DO. The stable results with DO can be attributed to orthotropic autologous bone formation in pterygomaxillary area. Kusnoto et al. also noted changes in pterygoid region after distraction and stressed for prolonged retention. Singh et al. concluded that maximum relapse occurred during first 6 months of postdistraction period and after that the outcomes were stable. Our study is in disagreement with the observation made by Wen-Ching Ko et al. which showed significant horizontal relapse in 1-year follow-up. Midface distraction with RED device provides a significant skeletal improvement in patients with cleft lip and palate. There was a marked improvement in dentofacial structures and results were stable during the retention phase 1-year postdistraction. Ross RB. Treatment variables affecting facial growth in complete unilateral cleft lip and palate. Cleft Palate J 1987;24:5-77. Heliövaara A, Ranta R, Hukki J, Rintala A. Skeletal stability of Le Fort I osteotomy in patients with unilateral cleft lip and palate. Scand J Plast Reconstr Surg Hand Surg 2001;35:43-9. Polley JW, Figueroa AA. Management of severe maxillary deficiency in childhood and adolescence through distraction osteogenesis with an external, adjustable, rigid distraction device. J Craniofac Surg 1997;8:181-5. Cheung LK, Chua HD, Hägg MB. Cleft maxillary distraction versus orthognathic surgery: Clinical morbidities and surgical relapse. Plast Reconstr Surg 2006;118:996-1008. Polley JW, Figueroa AA. Rigid external distraction: Its application in cleft maxillary deformities. Plast Reconstr Surg 1998;102:1360-72. Reddy LV, Elhadi HM. Maxillary advancement by distraction osteogenesis. Atlas Oral Maxillofac Surg Clin North Am 2008;16:237-47. Cheung LK, Chua HD. A meta-analysis of cleft maxillary osteotomy and distraction osteogenesis. Int J Oral Maxillofac Surg 2006;35:14-24. Saltaji H, Major MP, Altalibi M, Youssef M, Flores-Mir C. Long-term skeletal stability after maxillary advancement with distraction osteogenesis in cleft lip and palate patients. Angle Orthod 2012;82:1115-22. Sahoo NK, Jayan B, Roy ID, Desai A. Evaluation of the hard and soft tissue changes after maxillary advancement with rigid external distractor in unilateral cleft lip and palate induced maxillary hypoplasia, Med J Armed Forces India 2014. http://dx.doi.org/10.1016/j.mjafi.2013.12.016. Datana S, Kumar P, Roy SK, Roy ID, Londhe SM. Long term stability following maxillary distraction osteogenesis using rigid external distractor in cleft lip and palate patient: Case report. J Pierre Fauchard Acad (India Sect) 2014;28:1-4. Figueroa AA, Polley JW, Friede H, Ko EW. Long-term skeletal stability after maxillary advancement with distraction osteogenesis using a rigid external distraction device in cleft maxillary deformities. Plast Reconstr Surg 2004;114:1382-92. Kusnoto B, Figueroa AA, Polley JW. Radiographic evaluation of bone formation in the pterygoid region after maxillary distraction with a rigid external distraction (RED) device. J Craniofac Surg 2001;12:109-17. Singh SP, Jena AK, Rattan V, Utreja AK. Treatment outcome and long-term stability of skeletal changes following maxillary distraction in adult subjects of cleft lip and palate. Contemp Clin Dent 2012;3:188-92.